Enjoy this traditional Spanish dish served straight from the pan to bring that extra theatre to your event. Our paella can be served in the traditional sense or you can have it served in our retro mini-paella pans, direct to each table. This style of paella catering means that your guests will not have to queue. We offer paella catering for weddings, private parties, corporate events, gaming events, product launches, shooting events, fashion shows and more. Paella is such a great way to feed people, with the guests often flocking around our giant paella pans, in anticipation of the Spanish themed feast about to be served. If you would like a feast-style of paella catering for your wedding or event, we can serve the paella in our mini paella pans, which resemble the giant paella pans we cook in. A selection of sea foods cooked in saffron- spiced rice. A great choice for children, or as an alternative to a rice dish. 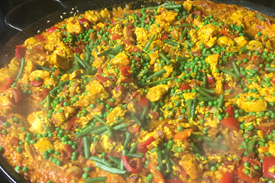 Our delicious vegetable paella made with Asparagus, Chestnut Mushrooms, Red Peppers, Chickpeas and Green Beans with a stock seasoned with Rosemary as standard.